Okay, okay, okay. Now that I’ve got my copyright violations out of the way right out of the gate, I can get to the real point of today’s article: A Pennsylvania motorcycle accident lawyer’s favorite motorcycle maintenance tips. See, it’s springtime and like any avid motorcyclist, I get very excited to get back on that bike and head out. But I every spring I have to remind myself that I can’t just jump on it with no preparation. Taking care of a few simple maintenance tasks will not only prevent damage to the bike, but it might even keep you from laying it down on the pavement. 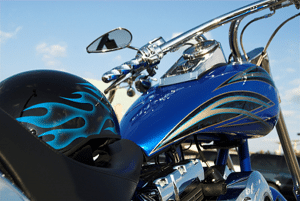 Performing all of these tasks will make your motorcycle safer, but they are all also very good advice for simply keeping your ride in top-notch shape. The information you’ll need to correct any of these issues can be found in your owner’s manual, so before heading out to the garage, dig that book out of your junk drawer or pull it off the shelf. Check for underinflated tires – This may be both the simplest, and most important task on the list. Even if your tires are just a little bit low, it affects your gas mileage, the way the bike sounds and feels on the road, and the handling and braking. And a motorcycle that does not handle right is basically an accident waiting to happen. Overinflation can be an issue too, but after sitting in storage for a few months, your tires are obviously much more likely to be low. Check the condition and depth of the tread while you are at it also. Make sure your chain is lubricated and is set to the correct tension – Incorrect chain tension can cause all sorts of glitchy behavior on the part of your drive train, such as rough gear shifting, premature gearbox wear, and more. Ultimately if not taken care of, this can significantly reduce the life of your entire drive train. Your owner’s manual will have detailed instructions for checking and adjusting the tension, but remember to have a pal sit on the bike while you set it, to ensure that the chain doesn’t overtighten when there is weight on it and you are already on the road, and away from your tools. While you’re at it, lube the chain as well to prevent rust, improve fuel efficiency, and promote a smooth overall ride. Check or change the oil and filter – This motorcycle maintenance tip is important for the protection and long life of your engine. Kick the bike on and let the motor run for a bit (not too long) to warm up and to circulate the oil throughout the system. Turn the engine off. Remove the oil cap, put a tray under the motorcycle, and remove the sump plug to drain the oil. Your manual will indicate which is the correct plug. When the oil has drained use a filter removal wrench to take the old filter out and replace it. Remember to confirm the correct torque before you tighten the filter in too snugly, and to spread a little clean oil on the gasket when you replace it. Refill the oil with the manual-recommended type and amount, replace and tighten the sump plug, then restart the engine. Let it run for five minutes, then turn it off again. While the bike is running check for leaks. Let the bike set for five minutes and check the oil level again. Lube your cables – With time and use, the factory lubrication in your throttle, clutch, and brake cables can dry out and become brittle or unresponsive. Lubricating or replacing your control cables is relatively simple, but does have to be done right, otherwise you could end up with a stuck throttle on the road, or mess up your clutch. First of all, refer to the factory manual (again!) to make sure you understand how to disassemble and reassemble the cable housing and connections, and closely follow any instructions included. For any cable though, be sure to inspect and clean the housing and check the cable itself for wear. If the housing is damaged or the fitting is worn, you’ll want to consider new cables. Use a dedicated cable lube to keep the cable sliding smoothly and without friction inside its housing. This will make for a smoother, more responsive ride, and extend the life of the cable. There is a tool called a cable luber that makes this task much easier. Re-install the cables, making sure any pivot points are clean and lubricated. Re-grease the clutch pivot and brake lever. Your manual should tell you how much slack you need to leave in the cables when you replace them. Change the Spark Plugs – Your manual will tell you how often to check or change your plugs, but as long as you are performing these tasks anyway, it should only take a few extra minutes to check for corrosion. Most of the time, they are fairly easy to get to with a spark plug wrench. Clean the contacts and gap with a toothbrush or small wire brush, or replace the plug if it is too far gone. Set the gap correctly using a feeler gauge. Screw the plugs back in to finger tightness, then use your wrench to tighten them down an additional quarter turn. I believe that these are the most important tasks you should perform to get your motorcycle road ready again after storing it for the winter. Failing to follow any of these motorcycle maintenance tips could conceivably result in a crash. Hopefully that will not happen, but if it does, Pennsylvania motorcycle accident attorney Lee Gaber, Esquire is at your service. Call us immediately at 888-292-5352. Consultations are free and there’s no fee until we win.